SoftPlanet makes it possible for everyone to get free Change Printer Plug-in download directly from our servers. There is no registration needed for downloading. Change Printer Plug-in 4.0.3.0 enables you to automate the process of changing printer drivers within your scripts. It is very appropriate for coordinating large and complex print procedures and switch among various printer/driver types like inkjet, laser, label, PDF and WinFax. This particular Windows version goes a bit further than its Mac one by enabling you to send ASCII text directly to a printer via parallel port. Change Printer Plug-in is a great addition for your FileMaker Pro software. It is very appropriate for complex print procedures. Feel free to share your observations with us. 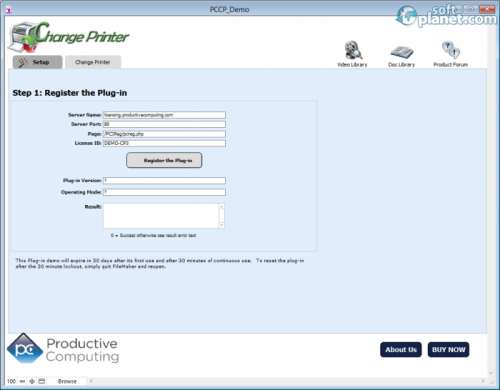 Change Printer Plug-in is VIRUS-FREE! Our security scan shows that Change Printer Plug-in is clean from viruses. The current version of Change Printer Plug-in has been scanned by our system, which contains 46 different anti-virus algorithms. That ensures that Change Printer Plug-in 4.0.3.0 is 100% safe for your computer.